A pure product of pop culture -- punk, New Wave, hip-hop, graffiti and break dance -- Keith Haring belongs to a group of young artists who nourished music and art in New York during the 1980s. "A more holistic and basic idea of wanting to incorporate [art] into every part of life, less as an egotistical exercise and more natural somehow. I don't know how to exactly explain it. Taking it off the pedestal, I'm giving it back to the people, I guess." Born in 1958 in Reading, Haring was not quite twenty when he first arrived in New York as a student. He worked out his artistic apprenticeship as much in the streets and slums of New York as in the studios of the School of Visual Arts where he was enrolled. But wait! This delinquent had also read the essays of Umberto Eco and discovered, through the reflections of this great semiologist, the relationships between the meaning of words and language. 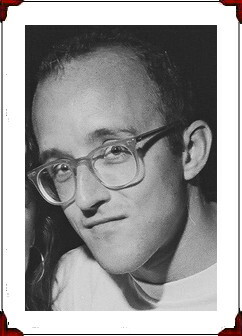 Keith Haring was driven by a fervent desire to communicate. His work -- built from an iconic language of signature lines and symbols -- continues to reach out to the broadest of audiences, dissolving the boundary between fine art and popular culture, between the gallery and the street. Despite his death from AIDS at age 31 in new York, Haring was a prolific artist and his vibrant contribution to our cultural landscape deserves close inspection. Haring first began to study these questions in videos, performances and collages of newspaper headlines before going on to build, little by little, his own vocabulary made of very simple figurative signs: hearts, babies, dogs and various silhouettes that take on thousands of different meanings depending on how he put them together. The rest is history. At the age of twenty-five, Haring had already invented a gripping, universally recognized visual language, accessible as much to neophytes as to connoisseurs. Six years later, he was dead, his blinding fame coinciding with the progression of the disease that killed him in 1990, at the age of thirty-one. "To do as much as possible as quickly as possible. I'm sure that what will live on after I die is important enough to make sacrifices of my personal luxury and leisure time now. Work is all that I have and art is more important than life."